I figured out how to make a slide show! So proud of myself. So here are the quilts I have hanging in the Art and Soul Gallery in Oak Hills Church. I will be there this Sunday from 9am to about 3 pm. If you’re in the area I’d love to see you. The Housetop quilts began as a simple challenge: to work entirely with solid colored fabrics. I had never worked with solids before, as there were so many beautiful prints that I loved. I looked and looked, and finally decided to make a ‘housetop style’ quilt. “Housetop” simply refers to the block pattern/structure that is used. It is similar to the more familiar “log cabin” block. The Housetop pattern was made famous by the Quilters of Gees Bend, a group of African American women in rural Alabama. I had the privilege of meeting these women several years ago, and was so inspired by them. In spite of their difficult lives, they made beautiful art out of just what they had on hand. And more than that, I was inspired by the way they seamlessly integrated their faith in God into every part of their lives. So as I started on the first housetop quilt, I happened to read a verse in the Bible that I had never noticed before. “Jesus said, ‘What I have whispered in your ear, shout it from the housetops.’ ” Hmmm. Isn’t that interesting? 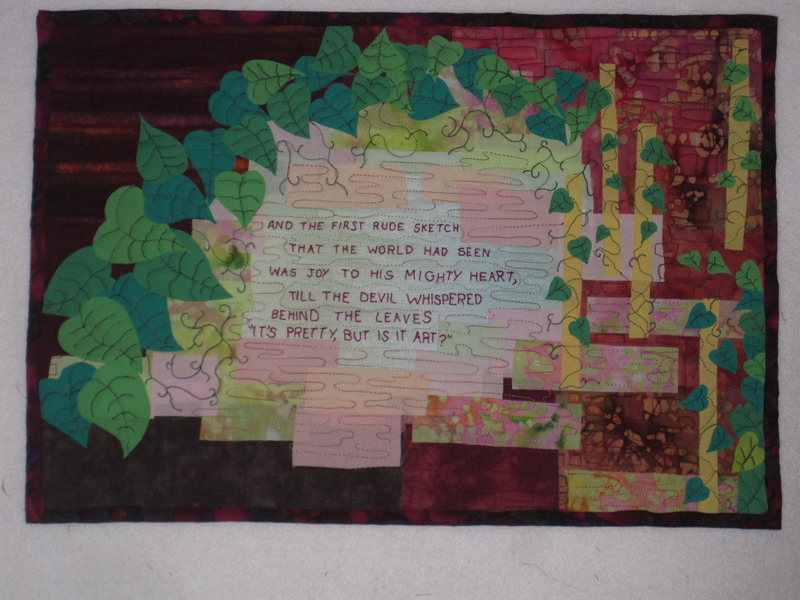 I am making a housetop quilt, and here is a verse using that same term. I also thought to myself, Hmmmph. You never shout anything from the housetops. What is wrong with you? I thought about these two things–the housetop quilt and Jesus words– all day long. And then it occurred to me. 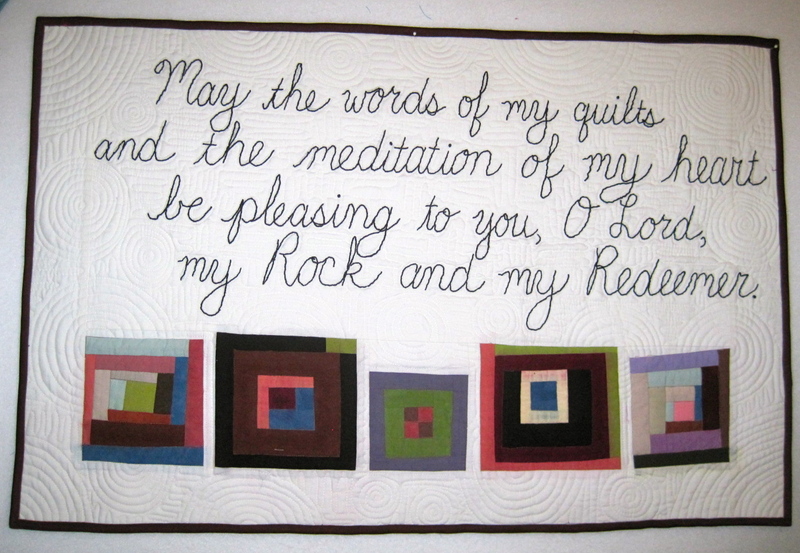 I COULD PUT JESUS’ WORDS INTO MY QUILTS. And that was the beginning of The Housetop Quilt Project. It has been a wonderful year of re-discovering old favorite verses, and finding new-to-me beautiful words of God to put into my quilts in various ways and using various techniques. 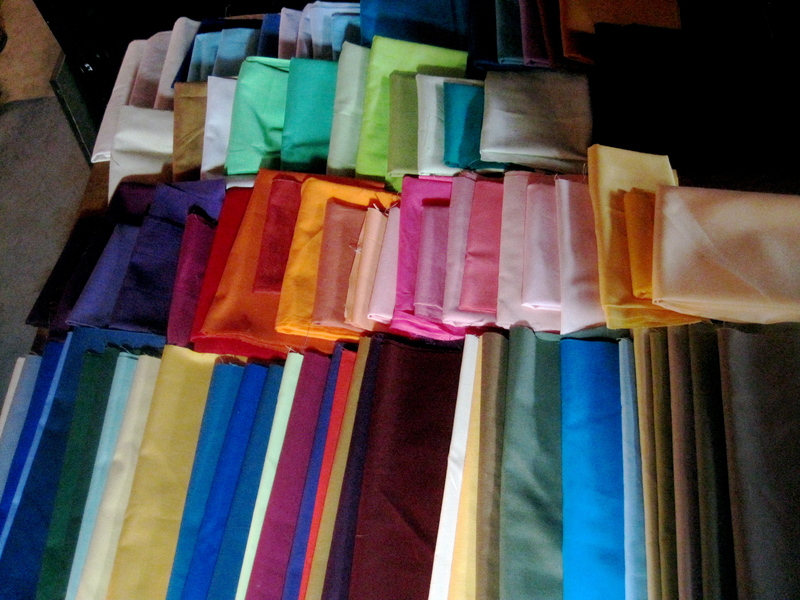 Can you believe how my stash of solid fabrics has grown? I think often of how I am inspired by people who just use what they have and make art (like the Gees Bend quilters.) I try to emulate that, but the truth is, I can (and do) go and buy fabric when the mood strikes. But I am not referring to being rich in fabric (which I am.) I am rich in so many other ways. I am blessed with good friends, and my best friend went and bought me 1/3 yard (my favorite amount to buy) of almost every kona color imaginable! That whole first row was a gift from my BFF! As I told her, it was so fun to receive such an extravagant gift, but more than that, it made me feel that this new venture was validated, and it made me feel loved. 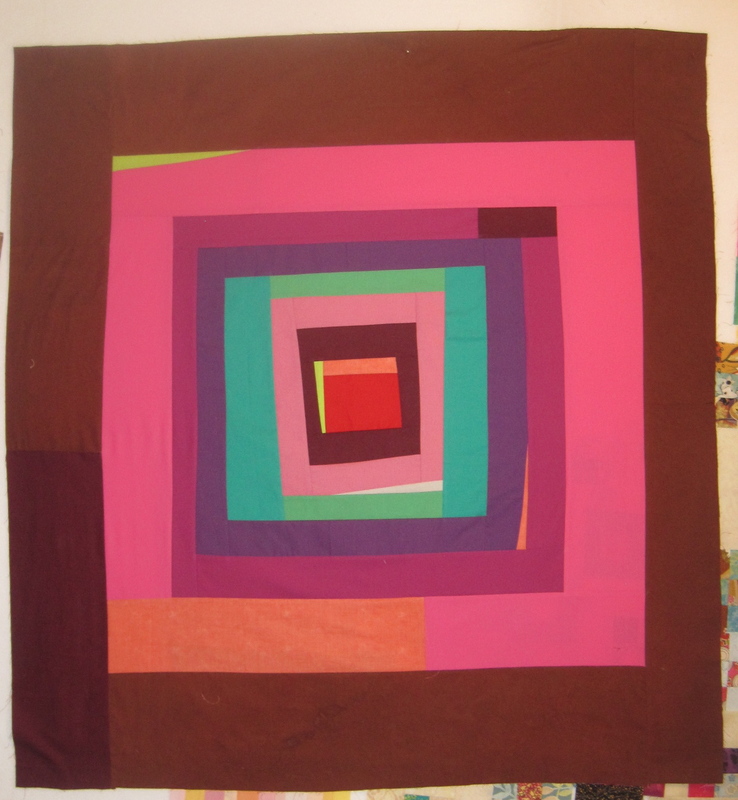 Here is the first little ‘art quilt’ that started my venture into using solids. I finished embroidering the words, quilted it, and then used the backing fabric to do a quick machine binding. Here is another way I am rich–my two little furry friends. 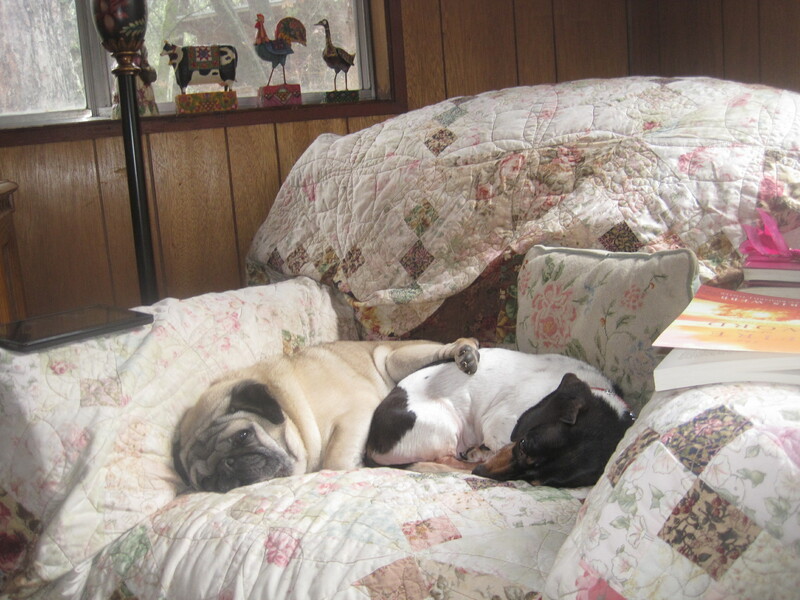 They are quite the pair–Sophie the dachshund was from a rescue organization, and Mr. Monk the pug came from the local pound–they gave him to me half-price because he was a senior citizen. He is a jewel! Do any of you use quilts for chair covers? I am thoroughly enjoying my venture into ‘housetop’ quilts. I have finished 4 tops already, and am in the midst of quilting them. Fun! So in my last post I mentioned going through a bunch of old magazines for inspiration. Most of the quilts in the little pictures that I cut out were made of large simple shapes. Some were wonky, and others were straight. But they were mostly simple shapes, and large pieces of fabric. In the last magazine that I looked at, one picture really caught my eye. It was a pattern by Pam Rocco (she doesn’t seem to have a website, but she is a frequent contributor to Quilter’s Newsletter Magazine.) It was patterned after the ‘Housetop’ quilts made by the quilters of Gees Bend. I am a real fan of the Gees Bend quilters. I love the fact that they just took what they had, which was very little, and made art out of it. And, I was fortunate enough to see several of them at the Sisters Outdoor Quilt Show. I was very touched by the depth and reality of their relationship with God. As they talked to the hundreds of women at that quilt show, they just naturally talked about God, praising him for the good in their life, and how they had to rely on Him in hard times. They broke out in song quite often, singing some of the old spiritual hymns. I bought one of their books that day, and I refer to it frequently for inspiration. I had just found this quote in their book about a week ago, and I LOVE it! So that was it! I would do a housetop quilt! I picked out my colors, which were a little different than my usual choices, a little bolder colors. I got to work, cutting pieces without measuring, and fitting them as I went. I did use my rotary cutter and ruler. I didn’t finish it that night, so planned to put the last few rounds on the next morning. Huh! And here I was working on a ‘housetop’ quilt. I finished the last few rounds. The brown fabric that is the last round is a special fabric that I wanted to include in this quilt. It was from a line of fabrics made to replicate the fabrics used by the Gees Bend quilters, and I bought it in Sisters when I met the GB quilters. I had to do a little finagling to figure out how to use the 1/2 yard of that fabric to make it fit. And as you can see, I actually had to ‘fill in’ with a bit of the other fabric. Making do with what I had, just as the original quilters would do. I am very happy with how it turned out. I would have made it a little larger, but then I really wouldn’t have had enough brown fabric. Later that night, I was still thinking about that verse and the quilt. And I came up with my next BIG IDEA. You guys are going to get tired of me and my big ideas LOL. Anyway, I was VERY excited about this one. I actually like quilting words. Its pretty easy, and I just like the idea of it. And I thought, how perfect–these solid fabrics are the perfect vehicle to quilt words on–and how great to choose some of my favorite passages from the Bible and quilt them right into the quilt. My BFF and I joke that we have a ‘manufacturing’ gene, and so of course, I am thinking about all the variations I can make with this, both with colorways, and verses. I imagine I WILL make a few more of these. 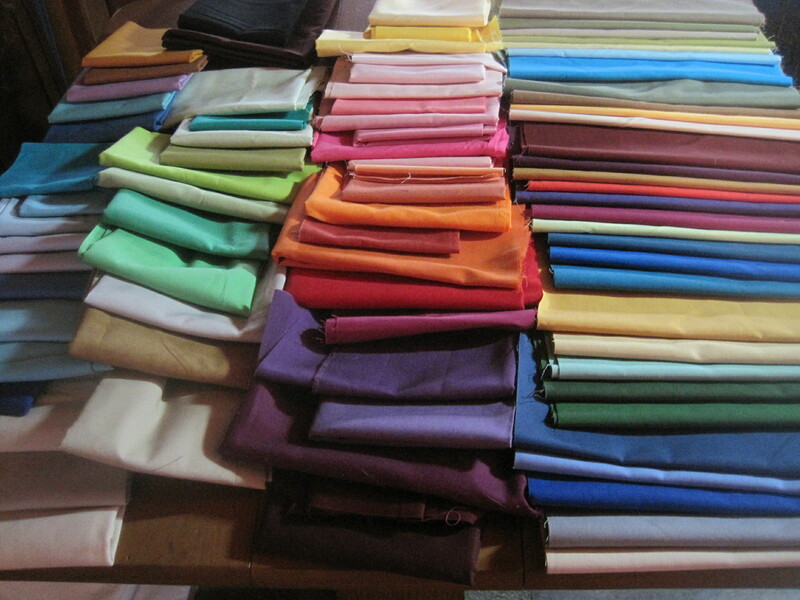 I have my solids all re-organized and ready for me to pick the next colors out. And then I will be done.